The Avengers arrive on Moon Knight's doorstep... for real this time. After watching Moon Knight's antics from last issue on the news, Buck Lime contacts the Avengers to inform them of Moon Knight and the Ultron head. The Night Shift are confronted by the mysterious kingpin of L.A., who vaporizes them for their failure to capture Moon Knight and Echo. Echo surprises Marc Spector in his mansion; she apologizes for the way she reacted to his kiss and agrees to work with him. Then the Avengers arrive and begin to question Spector about the Ultron head and what he intends to do with it. The Avengers stress that the Ultron head is dangerous, but Spector insists he knows what he's doing. 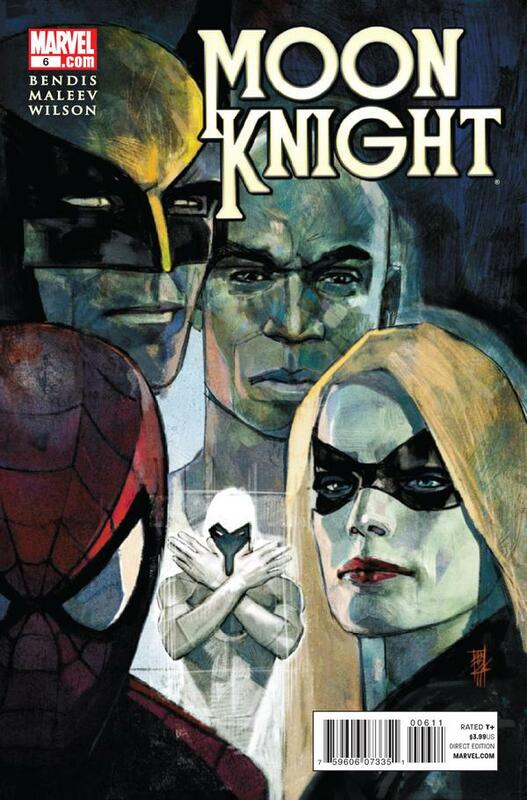 As you can probably guess by my short summary, not a whole lot happens in Moon Knight #6. After seeing how many significant events and revelations Dan Slott can pack into an issue of Amazing Spider-Man, it's a little jarring to go back to the slower paced Bendis books. Not that this issue was bad; I'm so used to Moon Knight chatting with Spidey, Wolverine and Cap in his head that I was just as unsure as he was as to whether they were actually there when they showed up at his home. Moon Knight is a great series, but readers who are strapped for cash may find waiting for and reading the trade to be a more satisfying experience.